In December, a panel of Drexel LeBow MBA students and C-level executives shared insights from the Lawrie Advanced Global Leadership Program, a recent addition to the Drexel LeBow MBA program. Endowed by J. Michael Lawrie, class of 1977 and member of Drexel’s Board of Trustees, the program was introduced to give promising students exposure to the private equity industry in addition to financial support for their studies. Through their performance in a consulting residency course during the spring 2018 term and their subsequent applications, two full-time MBA students, Joseph Dipre and Chris Stroup, were selected as scholarship recipients, giving them access to high-level internships and supplementary coursework. The scholarship also brought the opportunity to delve into high-level topics surrounding business strategy at two executive residencies with Lawrie – who is chairman, president and CEO of DXC Technology – along with several of his C-level colleagues from DXC and several other business leaders. 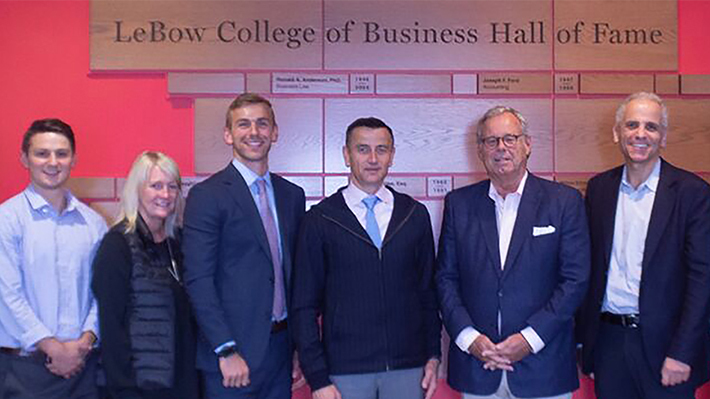 DiPre and Stroup, along with fellow MBA students Dhruv Gandhi, Mo Kadiri and Cory Terzis, all reflected and expanded on their discussions during the fall residency. In preparation for the second executive residency, they posed questions to a panel of executives from DXC Technology – Lawrie, EVP and Chief Human Resource Officer Jo Mason, EVP and CFO Paul Saleh – along with Krishnan Rajagopalan, President and CEO of executive search firm Heidrick and Struggles and William Forrest, Senior Partner with consulting firm McKinsey & Company. Lawrie and his colleagues weighed in on future hiring trends, both at DXC and within the high-tech space, a company of 150,000 employees worldwide. They also identified qualities, such as passion and “stick-to-it-iveness,” that are critical for successful leadership. Dipre, who secured an internship with private equity firm Graham Partners through the program, asked about the impact of a tight job market on DXC’s hiring decisions. Lawrie identified a shortage of availability of skills and shortfalls in STEM education affecting hiring both at DXC and in the tech sector generally, as well as an increase in “unincorporated individuals” – workers who come in on a project-by-project basis. He said that DXC has launched “DXC University” and a medaling program to help current employees develop new skills and build credentials. In reflecting on his experience in the program, Stroup, who interned in Drexel University’s Investment Office, said he most valued learning about different types of investments and about managing board relationships – topics he feels would who benefit his entire MBA cohort, and futures cohorts as well. “It was really interesting to get their perspectives on where they see the world going and how we can position ourselves to benefit and ride that wave,” he says.